49 Strand combines the flexibility and softness of thread with the strength & durability of stainless steel wire. 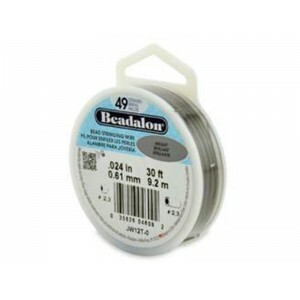 Specially designed for stringing ceramic, crystal, metal, and stone beads - as well as seed beads and freshwater pearls - Beadalon 49 Strand is the softest and most flexible of all Beadalon varieties. Designs fashioned from Beadalon 49 Strand drape very naturally without kinking. Beadalon 49 Strand is the finest choice wire for creating jewelry designs that look professional and remain secure. The smooth nylon coating provides good abrasion resistance, prevents kinking, and prolongs strand life. Beadalon 49 Strand is so soft and flexible, you can knot it. Made in USA by Beadalon.